Brown ground beef and sausage over medium high heat and drain excess fat. Add onion and garlic and saute' 2-3 minutes. Add tomatoes and a little water if necessary. Bring to a simmer, reduce heat and let simmer for 1-2 hours. In a large bowl combine eggs, cream cheese, Italian seasoning, garlic and onion. Mix with a hand mixer 1-2 minutes or until smooth. Fold in mozzarella and Parmesan cheese until well combined. Spread out into an even layer onto a cookie sheet lined with a silicone mat. Bake in a preheated 375º oven for 25-30 minutes or until golden brown. Let thoroughly cool for 20 minutes. Using a pizza cutter cut the noodles in half and then into 1.5-2" thick strips. Pour 1/4 of the meat sauce onto the bottom of an 8x10 casserole dish. Followed by a layer of noodles, 1/4 cup of ricotta cheese and 1/2 cup of mozzarella cheese. Repeat this process 1 more time starting with the noodles. After the mozzarella cheese is added to the second layer, top with another 1/4 of the sauce. Then top with the noodles and the remaining sauce. Bake in a preheated 375º oven uncovered for 35-45 minutes or until bubbly. Top with remaining mozzarella cheese and Parmesan cheese and bake another 15-20 or until the cheese is melted and golden brown. Let rest 15 minutes before serving. This noodleless lasagna is amazing. The noodleless noodles are delicious. I couldn't assemble for a few days and was afraid I'd eat all the noodles up and had to put them out of site. One piece Was super filling. Was wonder what the carb count is? Thanks Michele I'm glad you enjoyed it! I am not exactly sure on the net carbs. Sorry! Not sure how big this is but if you get 8 slices this would be it per slice. Thank you for posting this. I was wondering about the carbs. What would the fiber be? Wow this looks cool. Can't wait to try it! Thanks Wolfie!! The best noodles I've made yet. Most other recipes call for psyllium husk powder. Haven't been able to use that without it looking a little purplish, even with the best quality brand. These are really lovely. Thank you Diana! Glad you enjoyed it! ITS LOW CARB NOT NO CARB !!! WHERE IN THE RECIPE OR VIDEO DID IT SAY NO CARB? This is the best noodless lasagna ever. My son is a picky eater and he even liked it. Do I have to have a silicon mat or will it work with a cooking spray? No. As long as you have a totally non-stick surface just a pan would work. Ok tyvm I'm gonna try it tomorrow! Easy and delicious thank you for this recipe it was an instant family favorite. Thank you also for your you tube channel which lead me here. Keep eating for the people! I'm fairly new to cooking from scratch and goofed a bit on this one. I made mine in a 9 x 13 casserole dish without even thinking because it's such a gold standard. Still came out great but by the time I got to the top things got thin and I didn't have much mozza and meat sauce for the top. Doh! This was a great tasting learning experience. Thank you Larry! What is the yield? Thanks! In your recipe under the noodles ingredients you have 2 1/2 Mozzarella. I'm assuming that is cups but you may want to clarify that. This looks phenomenal. I have been on a ketogenic diet for well over a year in order to control my diabetes and have had phenomenal results plus I have almost effortlessly lost 75 pounds. I look and feel great. Thanks for pointing that out to me, I've fixed it to read 2 1/2 cups. Congrats on losing the 75 lbs!!! Can the noodles be made a day ahead? Just made this. OMG my new favorite. Not only easy but tasted like my old time favorite lasagna. The 'noodles' are so tasty alone, would make a great side dish cheese bread or crust for pizza. My family even loved it and had 3rds. I couldn't even tell the difference between this noodle and a box pasta noodle. This makes my Italian heart happy. Can't wait to try it! One question...could you brown the garlic and onion then add the meats to it? Maybe not as recipe calls for draining the fat from the pan. Hi Larry. This looks great and I'm going to make it today. I plugged the ingredients into Cronometer.com (I used diced tomatoes instead of crushed) and came up with the following; 5989 calories, 443g fat, 107g total carbs, 9g dietary fiber, 55g sugars, 383g protein. Because the meat recommendation is usually 1/2 lb per person, I divided into 8 servings so divide the above figures by 8 and you get the macro nutrients per serving. I CAN'T WAIT TO TRY IT!! 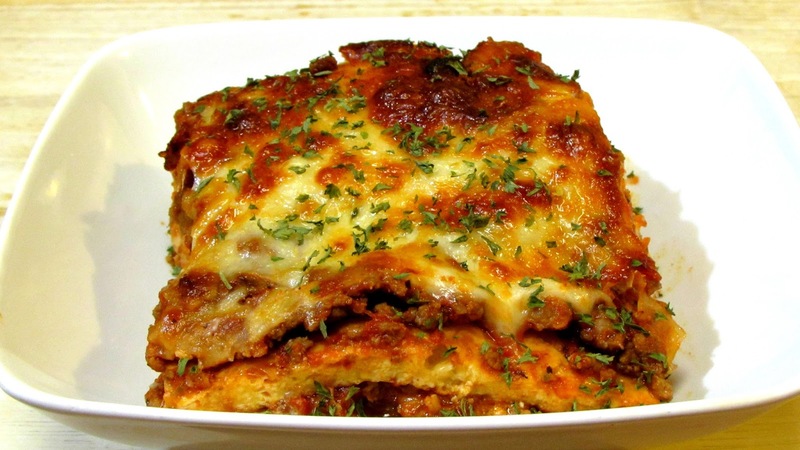 I'm new to Keto and would love to make this lasagna. I thought if we eat anything with sugar it knocks you out of Ketosis. So we tried the lasagna noodles with my wife’s regular lasagna and it was fantastic. So tonight I tried the noodles less the spices as potatoes in mousaka and it was awesome.